In early spring, pockets of snow shelter in the shadowed crevices of the high sierra. Brisk breezes, still carrying a tinge of winters chill, bend the boughs of mighty pine trees and spread their fragrance throughout the forests of Madera. To the north of town, at the narrow chasm of Arroyo de Garabato, the sun casts its first light on streaked, salmon-colored cliffs that plunge to the river below. Here, the cave dwellings of Cuarenta Casas are tucked into the rocky overhangs of these massive walls. The Cuarenta Casas archaeolgical site is the most well known and accessible of the cave and cliff dwellings in northern Mexico. No one is sure why they were built but their location high above the river with an encompassing view of both the sierra and the canyon suggests that they may have been guard posts along an old trade route that linked Paquime with the Pacific coast. The great Paquime culture flourished as the main trade and ceremonial center of northern Mexico around 1300 AD. Its trade routes extended to the Pacific, the Gulf of Mexico and to other cultural centers to the north such as Mesa Verde in Colorado and Chaco Canyon in New Mexico. The routes to the Pacific followed the Piedras Verdes River to the south and connected with the rivers that flow to the Pacific by way of smaller arroyos and canyons. Among these is the Huapoca Canyon to the west of the town of Madera. 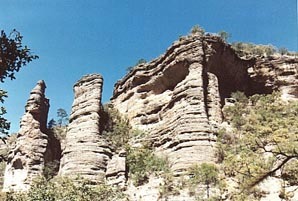 The Huapoca Canyon is not among the deepest of the Sierra Tarahumara but it possesses the most archaeological interest. There are five main cave communities near Madera. To the north are Cuarenta Casas and Cueva del Puente. At the beginning of the 16th century, explorer Alvar Nunez Cabeza wrote, "
" It is not certain if there were actually forty houses as fewer remain today. They can be viewed across the chasm from the visitors hut and are not accessible to the public except for Cueva de las Ventanas which has some 1000 year old Paquime-style adobe dwellings with characteristic T-shaped doorways and stucco floors. Cueva de las Ventanas is larger than Cueva del Puente and they both require about an hours hike one way along steep but well maintained paths. Directly to the west of Madera are the Anasazi caves and Cueva Grande. Although they are fairly close on a map, poor roads and unkept trails make it difficult to visit both sites on a one day trip. There are supposed to be guides available but this is not always the case so it is best for visitors to be accompanied by someone who knows the way. 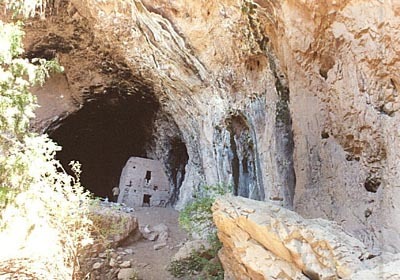 The Anasazi caves consist of the Cueva de la Serpiente and Nido del Aguila. 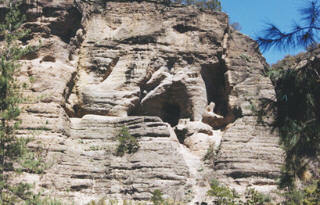 Cueva de la Serpiente is the larger of the two with 14 adobe dwellings that are over a thousand years old. Nido del Aguila has only one dwelling that clings precariously to the edge of a sheer cliff under a rocky overhang that gives meaning to its name, the Eagles Nest. The Anasazi caves are considered by some to be the most impressive of the cliff dwellings. This is due to the well preserved structures, the integrity of the site itself which has not been as vandalized as other sites and the magnificent views high above the broad expanse of the Huapoca Canyon. Across from the Anasazi caves, the descent from the sierra to the barranca is more gradual. Cueva Grande lies hidden within the convoluted folds of the land and is embraced by the branches of tall trees. The mouth of the cave is further obscured by a waterfall that cascades off the top of the cave to a pool and stream below. Even in drier months when the little waterfall is reduced to a trickle, the fine mist of water captures the sunlight to paint a delicate, shimmery rainbow. Its beauty, seclusion and constant water supply must have been idyllic to the people who lived in this parched, rugged terrain. A path rises from the pool to the caves entrance just behind the waterfall. There are two 800 year old, two-story dwellings that provide good examples of the construction techniques of that time. There is also a round grain storage area behind the structure closest to the mouth of the cave. The road forks just before crossing the suspension bridge at the bottom of the Huapoca Canyon on the way to Cueva Grande. 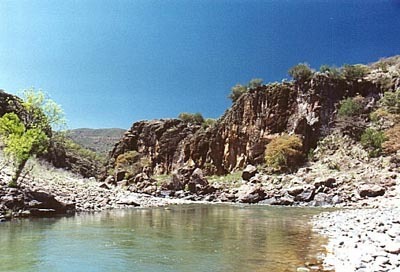 The left fork descends to Agua Caliente de Huapoca, a small thermal spring on the river bank. Its warm waters flow to a little soaking pool and continues on to the river where there is a natural swimming hole. Agua Caliente de Huapoca is reputed to cure a variety of ailments but it is perfect for sore feet after walking along the uneven trail to Cueva Grande. It is difficult to find a taxi driver to make the trip to La Rancheria where there are some fine ruins that cover an extensive area at the base of the Sirupa Canyon. Located 50 Km south of Madera (a two hour drive one way), there is a lengthy walk (another two hours each way) along a rough trail. A daytrip to La Rancheria requires a minimum of 9 to 10 hours with relatively little time to explore. The Sirupa Canyon is better visited on an overnight trip which also allows time to visit the site of the old San Andres de Sirupa Mission. It was destroyed during the Tarahumara uprising of 1690 and all that remains is the shell of a hacienda that was constructed there in 1830. However, the surrounding landscape is particularly beautiful and makes the half hour trip from the village of Sirupa worthwhile. Nearby, the thermal springs of Agua Caliente de Sirupa gush from the Sirupa River bank that is a good spot for camping. Spring and fall have the best balance of cool sierras and warm barrancas. The beginning of fall is especially beautiful when the poplars and alders of Madera begin to change color. Madera possesses a basic tourist infrastructure and is the closest town to the archaeological sites. It is reached from the nearby cities of Nuevo Casas Grandes, Cuauhtemoc and Chihuahua by local bus. 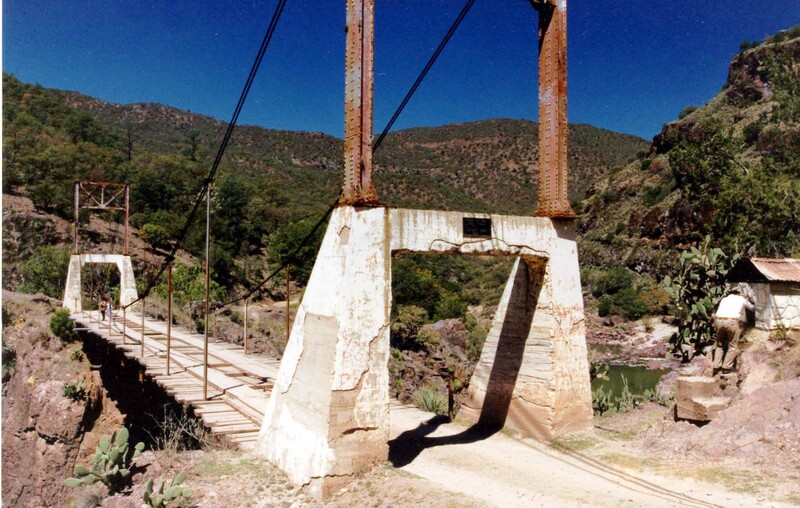 See the Getting There section of the Sierra Tarahumara for general information about traveling to the Copper Canyon region from Mexican and US cities. By car, Madera is located to the south of Nuevo Casas Grandes and to the northwest of Chihuahua. There are two main routes from Ciudad Juarez. The longer but more interesting route follows Highway 2 westward to Janos then south to Nuevo Casas Grandes and Buenaventura. Take Route 28 to Gomez Farias and about 11 Km out of town, watch the signs for the turnoff to Madera. The distance from Ciudad Juarez to Madera by this route is about 540 Km. The other is to take the toll road to Chihuahua. Exit at El Sueco and travel to Buenaventura where Route 28 leads to Gomez Farias and Madera. This route from Ciudad Juarez to Madera is approximately 490 Km. From Chihuahua, take the Cuauhtemoc toll road (Highway 16) for 101 Km to Cuauhtemoc and continue along Highway 16 to La Junta. Follow the signs to Guerrero, Matachi, Temosachi and on to Madera. The total distance from Chihuahua to Madera is about 285 Km. To visit the ruins, a good road leads to the Cuarenta Casas site and Cueva del Puente approximately 45 Km to the north of Madera. Cueva Grande (66 Km) and the Anasazi caves (33 Km) are reached along a dirt road to the west from the roundabout at the entrance to Madera. Along this road just out of town, is the turnoff to the Sirupa Canyon region where the caves of the La Rancheria complex (50 Km) are located. Substantial walking is required to visit the cave dwellings. Hiking boots are preferable for steep paths and loose scree especially in the rainy, summer months. Clothing should be comfortable and season appropriate. Remember that the sierras are cooler than the barrancas and even in summer months, a light jacket is needed. A flashlight is helpful for exploring the interior of the dwellings as well as the recesses of some caves. Within the canyons, bring a swimsuit and towel to take advantage of the refreshing rivers and thermal springs. All food and water must be carried into the canyon as no supplies are available outside of Madera. Five main cave complexes are spread along the length of the Huapoca Canyon and its side canyons and arroyos. The distance between the sites, poor roads and the necessity of a one to two hour walk to each site makes it impractical to visit more than one complex in the course of a single day. An exception is the Cuarenta Casas site which can be combined with the Cueva del Puente. Both are located along the same paved road but an early start is recommended due to the requisite hike to the sites and back. The best way to explore the Huapoca Canyon is by private 4WD vehicle with the option of camping when convenient. However, most visitors must make do with the limited tourist infrastructure of the region. Using Madera as a base, day trips can be undertaken to the cave dwellings. Tours are offered by the Motel Real del Bosque for groups of 4 to 6 depending on the destination. A more convenient alternative is to negotiate your own tour with a local taxi driver. The cost will vary but approximately $20 - $25 per hour is a reasonable rate. The few hotels in Madera are more expensive than comparable hotels in Creel. The Motel Real del Bosque, located at the entrance to town, is considered to be the best hotel available and it has a good adjoining restaurant. Travelers arriving by bus may find the Parador de la Sierra and Motel Maria to be more convenient as they are located within walking distance of the bus station and other restaurants. Their facilities are not modern but rooms are clean with private bathrooms and hot water. Nearby grocery stores have a good variety of canned and fresh foods for picnic lunches and to supplement the mostly fried meals available in the restaurants. Consider including a trip to Paquime when visiting the Huapoca Canyon. Their related history will make this journey more interesting. Dont try to incorporate all the canyons into a single Copper Canyon adventure. Each canyon is unique and should be explored leisurely. The Huapoca Canyon offers the best examples of thousand year old Paquime-style cliff and cave dwellings. The tourist infrastructure of this region is limited and there are no luxury accommodations available. Dont wander off the paths to the archaeological sites. The terrain is very rough and it would be unlikely to find help should you need it. Also, drug cultivators may occupy the barrancas of the remote Huapoca Canyon. Dont assume that it is easy to get from one place to another because they appear to be close on a map. Take all your food and water requirements when entering the canyon as few provisions are available outside of Madera. Motel Real del Bosque has the best accommodations in Madera. Consequently, it is frequented by tour buses and advanced reservations are highly recommended. It is the only motel in town that offers organized tours of the surrounding countryside including the archaeological sites. Tours require a minimum of 4-6 people depending on the destination. Northern Mexico Handbook by Joe Cummings has very good overall information about the Paquime culture and the archaeological sites of the Huapoca Canyon. 2001 Mexico and Central America Handbook by Peter Hutchison is published by Footprint Books in the UK and Passport Books in the US. There is a good section about Madera and the archaeological sites of the Huapoca Canyon. It also has the most current information about available accommodations in Madera.